Deoxyribonucleic Acid (DNA) is the molecular substance used to encode heritable information in all living cells. DNA is made up of a chain of nucleotides, which contain a sugar, a phosphate group, and a nitrogenous base. In eukaryotic cells, DNA is contained in a membrane-bounded region called the nucleus. It exists in long strands called chromosomes. The number and length of chromosomes differs among organisms. Prokaryotic cells have one circular chromosome, as well as smaller DNA pieces called "plasmids". The information is divided into discrete units called genes, which when activated send out instructions specifying cellular machinery to assemble proteins. 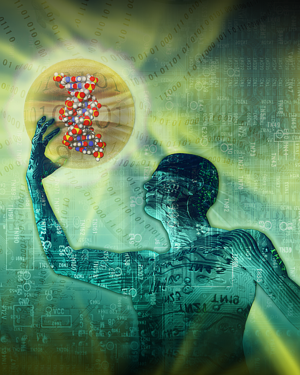 This process, called gene expression, is needed to build and maintain all biological systems. The instructions contained within genes consist of a code with rules of syntax comparable to those found in written language. In the DNA code, the gene is much like a sentence that contains "words" known as codons (triplets of nucleotides). A typical human cell contains a total of 46 chromosomes and about 6 × 109 nucleotides. To understand the data compression involved in this form of information, the amount of DNA in cell could in theory be packed into a space about 1.9 cubic micron in size. By comparison, 6 x 109 letters in a book would occupy more than a million pages, thus requiring more than 1017 times as much space. Diagram of the chemical structure of DNA showing base-pairing. A DNA chain is made up of four nucleotides that differ by the chemical base attached to each: adenine (A) and guanine (G), which are bases called purines, and cytosine (C) and thymine (T), are referred to as pyrimidines. Each base has a slightly different composition, or combination of oxygen, carbon, nitrogen, and hydrogen. In a DNA chain, every base is attached to a sugar molecule (deoxyribose) and a phosphate molecule, resulting in a nucleic acid or nucleotide. Individual nucleotides are linked through the phosphate group, and it is the precise order, or sequence, of nucleotides that determines the product made from that gene. The DNA that constitutes a gene is a double-stranded molecule consisting of two chains running in opposite directions. The chemical nature of the bases in double-stranded DNA creates a slight twisting force that gives DNA its characteristic gently coiled structure, known as the double helix. The two strands are connected to each other by chemical pairing of each base on one strand to a specific partner on the other strand. Adenine (A) pairs with thymine (T), and guanine (G) pairs with cytosine (C). Thus, A-T and G-C base pairs are said to be complementary. This complementary base pairing is what makes DNA a suitable molecule for carrying our genetic information—one strand of DNA can act as a template to direct the synthesis of a complementary strand. In this way, the information in a DNA sequence is readily copied and passed on to the next generation of cells. Two nucleotides that are paired together are called a base pair. Each of the nucleotides that are paired are attached together through hydrogen bonds. When the adenine and thymine are paired two hydrogen bonds are formed. When a cysteine and guanine are paired three hydrogen bonds are then formed. The reason a DNA molecule would be more strong would be because the content and the length of the DNA molecule affects it. DNA that makes up chromosomes and plasmids exists as two parallel strands. 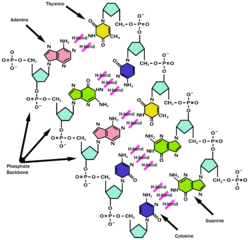 Each nucleotide in the strand it attached to the next through phosphate bonds. In addition, the two strands are also attached to each other at each nucleotide in the sequence through hydrogen bonding of the bases. In DNA, ATP always bonds to TTP in the adjacent strand, and CTP always pairs with GTP. This is known as base pairing, and the sequence of nucleotides on the parallel strands are said to be complementary. Each DNA strand runs from 5’ to 3’ (5 prime to 3 prime). DNA is known as the double helix because it is composed of two strands. There are two types of strands, the template strand (or antisense strand), and the coding strand (or sense strand). The template strand contains the information for various genes within the DNA. It also contains anticodons. The coding strand also contains codons. The information encoded in a gene is converted into protein or some form of RNA through a process known as gene expression. The process has two steps called transcription and translation. First the DNA sequence transcribed into RNA and then usually--but not always-- translated into protein. A gene is said to express itself, because it sends out a "message" (messenger RNA) with instructions for a specific protein to be made. The messenger RNA is essentially a copy of the gene that is delivered to a cellular machine (ribosome), which then uses the information to assemble a specific sequence of amino acids. This is known as the central dogma of gene expression. Sequences that code for proteins are called structural genes. Although it is true that proteins are the major components of structural elements in a cell, proteins are also the real workhorses of the cell. They perform such functions as transporting nutrients into the cell; synthesizing new DNA, RNA, and protein molecules; and transmitting chemical signals from outside to inside the cell, as well as throughout the cell—both critical to the process of making proteins. A class of sequences called regulatory sequences makes up a numerically insignificant fraction of the genome but provides critical functions. For example, certain sequences indicate the beginning and end of genes, sites for initiating replication and recombination, or provide landing sites for proteins that turn genes on and off. Like structural genes, regulatory sequences are inherited; however, they are not commonly referred to as genes. Forty to forty-five percent of our genome is made up of short sequences that are repeated, sometimes hundreds of times. There are numerous forms of this "repetitive DNA", and a few have known functions, such as stabilizing the chromosome structure or inactivating one of the two X chromosomes in developing females, a process called X-inactivation. The most highly repeated sequences found so far in mammals are called "satellite DNA" because their unusual composition allows them to be easily separated from other DNA. These sequences are associated with chromosome structure and are found at the centromeres (or centers) and telomeres (ends) of chromosomes. Although they do not play a role in the coding of proteins, they do play a significant role in chromosome structure, duplication, and cell division. The highly variable nature of these sequences makes them an excellent "marker" by which individuals can be identified based on their unique pattern of their satellite DNA. Another class of non-coding DNA is the "pseudogene" (meaning false gene), so named because they were originally believed to be a remnant of a real gene that has suffered mutations and no longer functional. Evolutionists believe that pseudogenes may have arisen through the duplication of a functional gene, followed by inactivation of one of the copies. The sequences are therefore thought to carry a record of evolutionary history, and used to deduce relatedness by evolutionary geneticists. The method involves comparing organisms for the presence or absence of pseudogenes and grouping species based on degree of difference. The view of evolutionists regarding pseudogene sequences is in stark contrast to creationists predictions which assume a purpose for all so called Junk DNA and asserts that functions for these genetic sequences will be elucidated in time. The creationist view has recently been justified by researchers who recently uncovered a function for pseudogenes in regulating gene expression by means of the RNA interference pathway. Not all genetic information is found in nuclear DNA. Both plants and animals have an organelle—a "little organ" within the cell— called the mitochondria. Each mitochondrion has its own set of genes. Plants also have a second organelle, the chloroplast, which also has its own DNA. Cells often have multiple mitochondria, particularly cells requiring lots of energy, such as active muscle cells. This is because mitochondria are responsible for converting the energy stored in macromolecules into a form usable by the cell, namely, the adenosine triphosphate (ATP) molecule. Thus, they are often referred to as the power generators of the cell. Unlike nuclear DNA (the DNA found within the nucleus of a cell), half of which comes from our mother and half from our father, mitochondrial DNA is only inherited from our mother. This is because mitochondria are only found in the female gametes or "eggs" of sexually reproducing animals, not in the male gamete, or sperm. Mitochondrial DNA also does not recombine; there is no shuffling of genes from one generation to the other, as there is with nuclear genes. DNA sequencing is a technique used to determine the exact order of the building blocks (nucleotides) that comprise DNA. One such technique is reliant on the use of dideoxy nucleotides that will terminate the polymerization of the DNA strand at each type of nucleotide, and radioisotope-labeled nucleotides to visualize the pool of fragments. Nucleotides are distinguished by the nitrogenous bases they contain and abbreviated by the letters A, C, G, and T (these can be easily remembered with the saying "God Authored The Code"). Therefore, DNA sequencing data is typically a long string of these letters (i.e. ACGCTCATCGTAA). The Human Genome Project discovered that to improve the DNA sequencing they had to speed up the process of DNA sequencing. The standard method that was used in DNA sequencing is based on the separating of DNA fragments. The way the DNA separated into fragments is by gel electrophoresis. These methods were too labor intensive and cost too much money. To make things cheaper they decided to use gel-based sequencers, which are multiple tiny tubes run what they used to perform electrophoresis. The separations from this method are much faster because they have higher electric fields to complete the DNA sequencing in a shorter amount of time and this was also more cost effective. In the 1940’s Erwin Chargaff discovered what came to be known as Chargaff’s rule. He found that in DNA, the number of nucleotides possessing adenine and thymine nitrogenous bases was about equal. Also, the nucleotides with cytosine and guanine was about equal. ↑ Prokaryotic and Eukaryotic Cells. 9 September 2004. College of DuPage Center for Independent Learning. This page was last modified on 21 April 2016, at 19:49.